State media said Hwasong-12 rockets would pass over Japan and land in the sea about 30km (17 miles) from Guam, if the plan was approved by Kim Jong-un. It denounced Donald Trump's warnings of "fire and fury" and said the US leader was "bereft of reason". The US has warned the North its actions could mean the "end of its regime". US Secretary of Defense Jim Mattis said Pyongyang would be "grossly overmatched" in any war against the US and its allies. The BBC's Rupert Wingfield-Hayes, who is in Guam, says there is a sense that the North Korean threat is rhetorical, as most people feel that if they really did strike with missiles it would be suicidal for the North Korean regime. Separately, the European Union said it was freezing the assets of nine more people and four more entities, including North Korea's Foreign Trade Bank, in line with fresh sanctions approved by the UN Security Council on Saturday. What is the North planning? The North first announced on Wednesday that it had been drawing up plans for a missile strike against Guam, a Pacific island which is home to US military bases, strategic bombers and about 163,000 people. 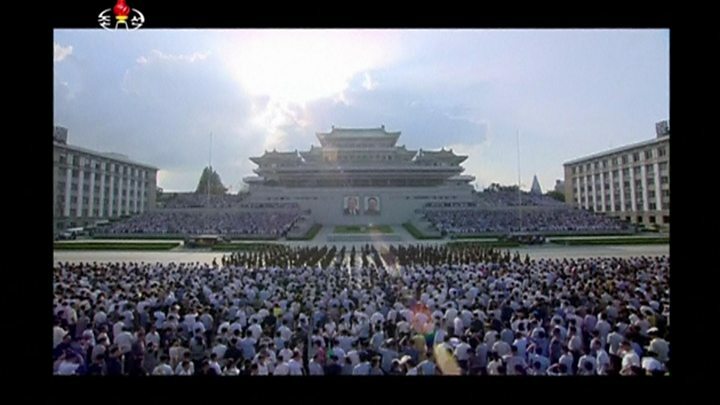 A later statement carried by state media said the military would "finally complete the plan" by mid-August and send it to leader Kim Jong-un for his approval. Media captionThe BBC's Robin Brant asks those in the South Korean capital, Seoul: "Are you scared?" "The Hwasong-12 rockets to be launched by the KPA [Korean People's Army] will cross the sky above Shimane, Hiroshima and Koichi [Kochi] Prefectures of Japan," state news agency KCNA said, quoting army chief General Kim Rak Gyom. Reality Check: Are Trump's N Korea assumptions right? Should you worry about war? "They will fly 3,356.7km for 1,065 seconds and hit the waters 30-40km away from Guam." The Hwasong missiles are North Korea's domestically produced medium and long-range weapons. What has been the reaction in the region? The governor of Guam addressed the North's new statement on Thursday, telling Reuters news agency that North Korea usually likes to be unpredictable and has fired surprise missiles in the past. "They're now telegraphing their punch, which means they don't want to have any misunderstandings. I think that's a position of fear," said Governor Eddie Calvo. Meanwhile Japanese government spokesman Yoshihide Suga said Pyongyang's actions were "provocative to the region including Japan as well as to the security of the international community". "We can never tolerate this," he added. Defence Minister Itsunori Onodera told MPs Japan could legally intercept a North Korean missile headed for Guam because such a move would threaten Japan's existence as a nation. Recent legislation also allows Japan to defend the US and other allies from attack. Previously Japan's position was only to shoot down missiles headed for its own territory. South Korea's military said it was prepared for swift action. "If North Korea conducts provocation in defiance of our military's grave warning, it will confront the strong and firm response of our military and the US-South Korea alliance," Joint Chiefs of Staff spokesman Roh Jae-cheon said. The foreign ministry in Seoul, meanwhile, urged Pyongyang to respond to its recent offer of new dialogue. China has urged calm, describing the situation as "complex and sensitive". What have the two sides been saying? 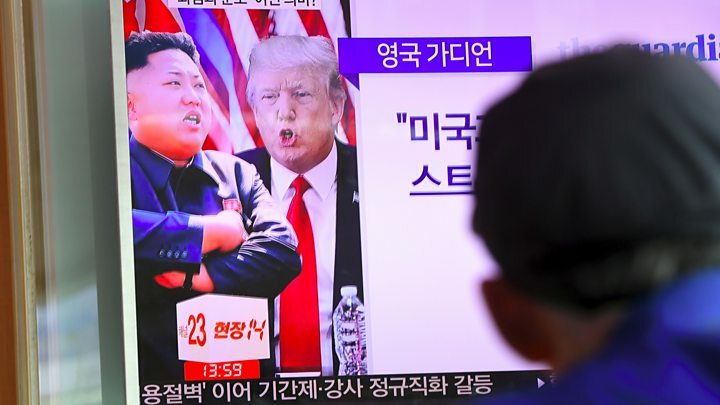 North Korean state media said President Trump's remarks on Tuesday that the North risked "fire and fury" for threatening the US were "a load of nonsense". "Sound dialogue is not possible with such a guy bereft of reason and only absolute force can work on him," it added. Amid escalating rhetoric, Mr Mattis issued a strongly worded statement on Wednesday calling on Pyongyang to halt its arms programme. 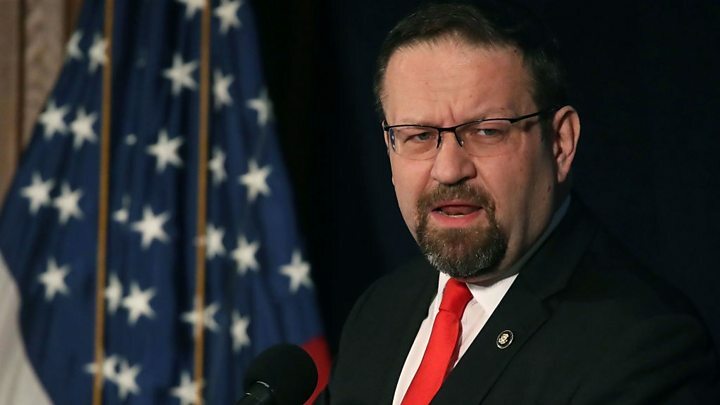 "While our state department is making every effort to resolve this global threat through diplomatic means, it must be noted that the combined allied militaries now possess the most precise, rehearsed and robust defensive and offensive capabilities on Earth," he said. What damage could N Korea do without nuclear weapons? Mr Trump, who is holidaying in New Jersey, boasted about America's atomic arsenal earlier on Wednesday. The 541sq km (209 sq miles) volcanic and coral island in the Pacific between the Philippines and Hawaii. It is a "non-incorporated" US territory, with a population of about 163,000. That means people born in Guam are US citizens, have an elected governor and House Representative, but cannot vote for a president in US national elections. US military bases cover about a quarter of the island. About 6,000 personnel are based there and there are plans to move in thousands more. It was a key US base in World War Two, and remains a vital staging post for US operations, giving access to potential flashpoints like the South China Sea, the Koreas and the Taiwan Straits. US Secretary of State Rex Tillerson has sought to reassure Americans that North Korea does not pose an imminent threat. On Wednesday, he said the situation had not dramatically changed over the past few days, and that Americans "should sleep well at night". South Korea's military says it has not seen any unusual action in the North that might indicate a provocation. Despite rounds of UN sanctions, Pyongyang carried out two nuclear tests last year and two intercontinental ballistic missile tests in July. Various reports recently have suggested the North has now achieved its goal of making a nuclear warhead small enough to fit inside its missiles. But this remains unconfirmed, and most analysts doubt the country would launch a pre-emptive attack on the US. What damage can North Korea do? 'Fire and fury': What next?